4. In the Email field, enter in your full email address. 6. Enter your full email address as the Username. 7. Enter in your Google Apps Mobile device password (NOT your network ID password) as the Password. 9. Choose Cancel if the Unable to Verify Certificate dialog appears. 10. When the new Server field appears, enter in m.google.com. 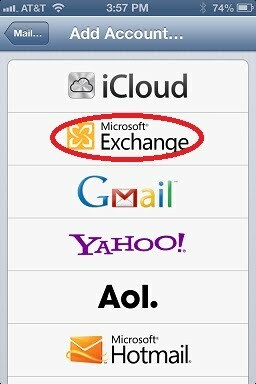 If you're running iOS 6 or later, you will need to re-enter your full email address as the Username. 11. Press Next at the top of the screen. 12. Select the Google services (Mail, Calendar and Contacts) you want to sync. To receive and respond to meeting requests on your iOS device, both Mail and Calendar need to be turned on and New events needs to be enabled in your Google Calendar settings. To enable "New events" in your calendar, sign in to your Google Calendar using the web browser on your iOS device or a computer. Go to Calendar Settings > Calendars > Click on the Notifications for the calendar you want to sync. Under Email check "New Events" (and any of the other invitation settings you want enabled) and click Save. If you already have contacts on your iPhone, you'll be prompted if you want to keep them or not. If you choose Keep on My iPhone, your contacts will synchronize with your Google account. 1. From the main screen, go to Settings. 2. Click on Mail, Contacts, Calendars. 3. 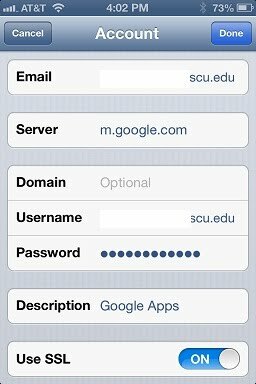 Select your SCU Google account from the list. 4. You should now see the summary screen for your account. Select Mail Days to Sync to adjust how far in the past you would like to keep your emails on your iOS device. 1. On your mobile device, go to https://m.google.com/sync/settings/ (note that you must include the "/" after "settings"). 2. Select "Sign in with your Google Account". 3. Use your full email address as your username and leave the password field blank. Click on "Sign in". 4. You should be directed to the SCU Login screen. Login with your SCU Network login ID and password to continue. 5. Once your signed in, you'll see a list of mobile devices which have accessed your account. Choose the appropriate mobile device from the list. 6. From the list of calendars, place a check-mark next to each one you want on your iOS device. Click "Save" to save your changes. 7. You should see a "Device settings saved successfully!" message. 8. In a few minutes, the new calendar(s) will appear on your iOS device. To verify, open the Calendar app on your iOS device and select the "Calendars" button in the top left corner. Your viewable calendars will be listed here. If you do not see the new calendar(s), wait a few seconds and they should get added to the list.